My husband and I were privileged to have a getaway weekend just the two of us, to NYC. We all know how needed those trips are! One of the highlights was going to the Museum of Modern Art, MOMA. Van Gogh's Starry Night, one of the amazing art works there. While there, I saw several families with young kids and began to ponder how best to see art museums with young kids. 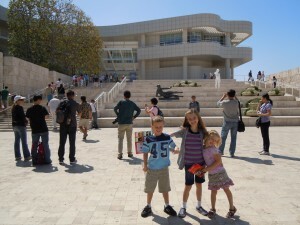 I also remembered when we took our youngsters to the Getty Museum in LA. 1. Choose the right time of day. For toddlers and preschoolers, make sure they are not sleepy or hungry. For babies, if they will sleep in a stroller or sling, you could chance that or choose a time they would be at their happiest. 2. Plan your visit. Prioritize the art work you want to see and hit those first. Try not to pack too much in and take breaks. And be realistic about the amount of time you will spend there. 3. Remind your child about the rules when around art. My husband has been displaying his photography in art shows for several years. With so many fine things to look at, our children have learned, even when barely speaking, to “not touch” and walk with hands behind their backs when getting close to others’ works. Especially if you model the correct behavior, your child will watch and learn from you. We would make it a “copy me, follow me” game. Some children might need to follow the rule of “holding hands” with you as you walk through a gallery. 4. Take breaks. Like mentioned in tip 2, use these breaks as a refresher so you can squeeze in a little bit more. Most museums have cafes, bookstores, or outside areas. A snack, taking time to check out the stuffed animals or children’s books, and taking a breather outside can help tremendously. You could even swap watching kids with your spouse or others in your party to go look at artwork kid free for a few minutes. Don’t forget the bathroom breaks as well. Check the rules about snacks in the museum. Usually bottles are fine, but double check about other snacks. 5. Bring a small sketch pad or Memo spiral. Most museums won’t allow crayons, markers, pens, etc., but will allow pencils. Give your child the pad and pencil, and show your child how to draw shapes they see or interesting things around them. Just make sure to be right next to them when your child is walking around. I observed one mother doing this activity with her preschooler while we walked in the gallery. The child was extremely engaged in trying to draw some artwork. -MOMA Audio guides for kids. I love that they have guides specifically tailored to kids listening. 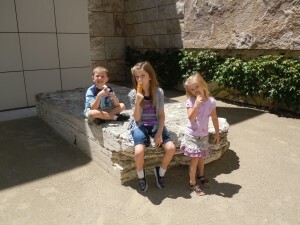 When we went to the Getty, I loved the kid space there as well. 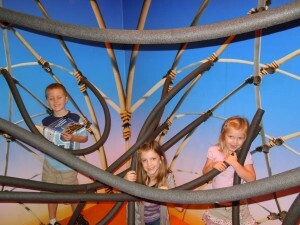 My kids LOVED that they could touch and interact with all the cool things in this space. 7. Play a game. On the Getty museum’s website, it suggests games like I Spy and Scavenger Hunt to introduce kids to the different types of things you can see in an art gallery. For example, you could play I spy to spot a color or do a scavenger hunt for all the squares you can find in one room. 8. Ask questions. Which is your favorite art on this wall? Which one is the ugliest? Which one do you think you could paint? It could be interesting for you to write down your child’s answers for later sharing with family or to record in a journal. AS we know, kids say the “darndest” things. 10. Be sure to check the schedule of events. There might be a tour or small group starting just for kids and families. Once at a car show, my daughter enjoyed using a notepad to make a list of the cars she liked. You could do this with the art and even expand it to a tiered list such as Love, Like, and Dislike. The parents could get involved by guess what the child put. Thanks for the imagery of your daughter at the car show. Good idea with the tiered list for kids that are ready for that. 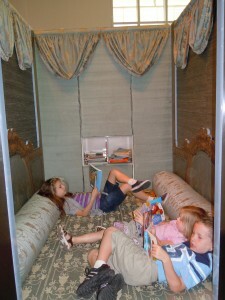 Next post: 12 Best Kid-friendly destinations? What do you think? Happy Little Travelers ©2012 All rights reserved. 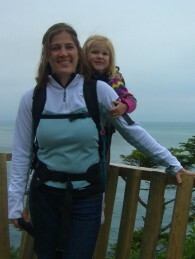 I'm Laura--mother to 3, early childhood teacher, and wife of a travel photographer. As a family, we enjoy traveling all over, camping, cooking, and basically anything outdoors. I also have a book in the works filled with ideas for car traveling. 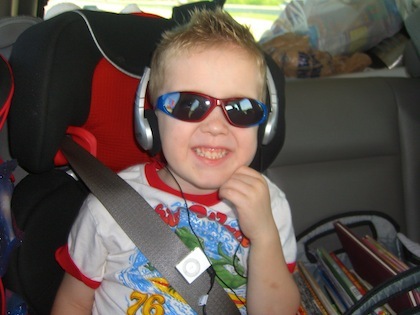 If you like something on here, please help me spread the word to reach more families. Thank you! Fly or Drive? That is the question.